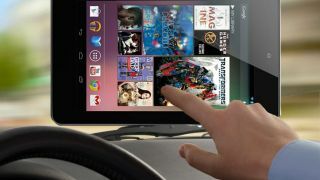 "An iPad would fill the fricking windshield"
You may be eyeing up that 7-inch tablet as a potential sat-nav replacement, but navigation expert TomTom insists that the ideal size for the average car is actually somewhere between a Samsung Galaxy Note and a Google Nexus 7. TomTom announced at IFA 2012 that it would be rolling out an update to its Android app that allowed for offline maps – a significant step for the sat nav company. With phone screens seeming a little on the small size for many who are considering replacing their existing navigation device, it could well be the spate of 7-inch tablets that offer up an interesting option. But, speaking to TechRadar at the Berlin show, the company's engaging MD Corinne Vigreux insisted that there was a reason why the company stopped at 6-inches for its navigation devices, although she is not attempting to dictate what the consumer should go for. "The thing with sat nav or with any form factor is that 7-inches is just a bit too big," said Vigreux "That's the reason why we went for 6-inches – and believe it or not 6-inches is more expensive to manufacture than a 7-inch because there are fewer 6-inch screens. "The reason we have done that is that we always think about the customer experience so when you are in the car 7-inches is little bit too obstructive. "If you are in a truck or a big SUV then you might be okay with a 7-inch but we think that 6-inches is the right size. It's a compromise between the phone and tablet. "I'm a great believer in not telling the consumer what to buy – I will offer it to them and let them choose." The TomTom app is a good example of the company's stated 'platform agnostic' approach, and it does work on Apple's iPad, although Vigreux joked that using Apple's 9.7-inch tablet might be a bit excessive. "The TomTom app works on iPad although I've never seen anyone using their iPad as a sat nav in a car. "But if they want it then that's fine [but] if you have a Mini it would take up the whole fricking windscreen!"